"Grab a phone and come quick," I shouted to Brad across the cactus-lined chain-link fence. I hoped I had left a window open and he would hear me from the neighbor's yard. It was the house next door, but no one had lived there since we’d arrived. I had braved the intense mosquito population next door to practice my micro photography skills on the tortoises living there. 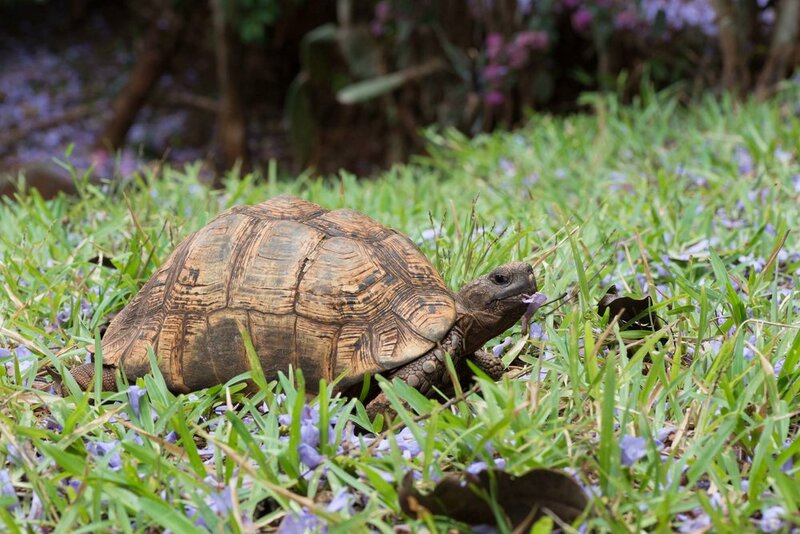 After all, tortoises remain still, right? Wrong. 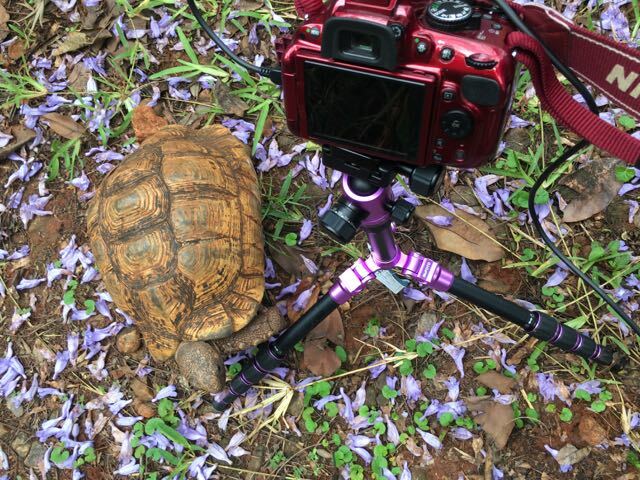 I'd clicked the remote shutter four or five times before the tortise turned, walked straight toward me, climbed over my purple Manfrotto tripod leg and pushed its snout into my boot. Brad arrived in sandals. I wondered aloud if tortoises bite. I backed away, set my tripod into the mud, and it came after me again. It drove its snout into my boot. I stood my ground. It tucked in head into its house and rammed me with its shell. It continued pushing. Its little legs were shoving at the earth as it attempted to propel itself forward against my boot. We were having a territory dispute, and I was losing. I tried a few more times to photograph it, but the effort was useless - it chased me until I retreated to the lower yard, where I found the other turtles, well, tortoises. I keep making this blunder - they are land dwelling and therefore, tortoises. I think they are Leopard Tortoises. There are four. Someone, at some point, must have gathered them and brought them to this yard and no one is exactly sure where to return them. I crept up to Number Two, the largest of the four; it had an elongated hole in its shell. I had asked someone about this injury before. It is possible it had been struck by an ax in an attempt to kill and eat it. Perhaps it was safer to live in the backyard. Number Three ignored me. Number Four hid in its shell and stared and me a few moments before deciding to walk away, but not before I noticed a textured pattern in place of the typical markings. I wondered what had happened to it. I climbed the rock slope through the tired garden to photograph a jackfruit. Behind me, I heard crunching leaves and looked up to see that Number One was still feeling tough. "Okay," I relented, " I'll go." I stepped through our rusty gate wishing I dared to defend myself confidently despite the size of my shell. November 3 I wanted encounters with the wildlife, culture, and society that expand my soul and add chapters to my book of experience. November 4, I wished for time to do all of these things. Today, I wished for the courage and confidence to believe in myself as bravely as Number One.